We’ve all been there. You’re in the middle of writing a story or a play, putting together your photography portfolio, creating a D&D campaign, or even writing a blog post, and the inspiration stops. BAM: You’ve been writer-blocked. Luckily, inspiration can be just a couple taps away on your iPhone or iPad with the Muse apps by Rasmus Rasmussen. I had the pleasure of trying out his apps over the past couple days, and I’m in love. 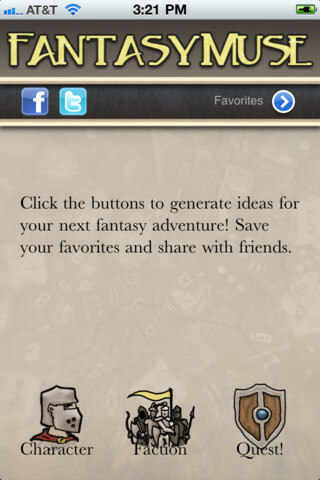 Each app gives you suggestions that are randomly generated and put together, allowing you to continue writing with a new prompt, character, or setting in mind. The apps themselves are very simple but effective. Check out all three below and see how you can win one yourself! 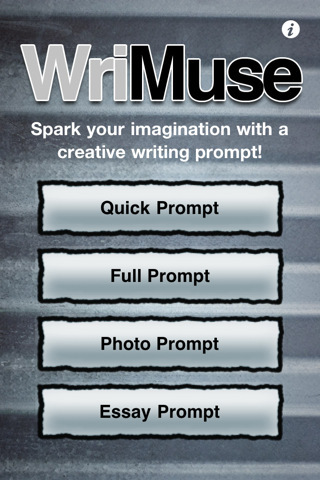 WriMuse offers a variety of prompts (as seen in the main menu screen at the top of this post), including prompts to add to an existing story, create a new story, or even create a blog post or essay. 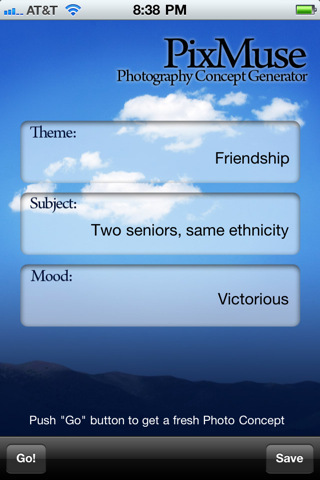 One of my favorites is the photo prompt, where it randomly generates a photo and a title for you to write a story or scene about. One random prompt I just received was a picture of a burger with the title “Blood Conundrum”. Yep. 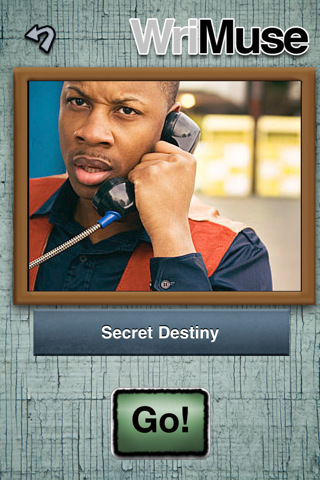 $1.99 in the App Store. FantasyMuse is perfect for all the Game Masters out there who have been stuck on creating an NPC or faction for their players to run into. This randonly generates either a character, faction, or quest to keep your game going. Once you find something you like, you can save it as a favorite (to use at a later date), email it out, or copy it to a clipboard. It could be fun to randomly generate each person’s character and then email it to them before the start of the game! PixMuse is very simple but could give you a great idea for a future photo shoot. It gives you a theme, subject, and mood based on common images used in stock photography. Some of these might be a bit tougher to go out and do than just writing (for instance, do you have access to an elderly couple, or three models of different ethnicities or generations? ), but they may help spark a different idea. Like FantasyMuse, your favorite ideas can be emailed or copied to your clipboard. $0.99 in the App Store. Want to give the apps a try? Just leave me a comment with which app you want the most, and I’ll randomly pick three winners (one for each app)at noon on Wednesday, February 8th. Winners will be announced and notified that afternoon! Good luck! EDIT: Congratulations to Veronica for winning the Wri-Muse app and Anna-Marie for winning the FantasyMuse app! An email will be sent to you with the code. Know a photographer looking for inspiration? The Photography app is still up for grabs! First photographer to comment will get it. I was provided with review copies of the apps as well as copies to give away in exchange for this review. All thoughts expressed in this review are mine alone. Are you interested in a review or giveaway for your product? Contact me at tara@geekyhostess.com. I would love to try wrimuse considering I am a writer 🙂 Thank You for considering me. oh man writing prompts are super useful. hook me up. These actually seem really awesome. I remember you mentioning them! WriMuse sounds particularly up my alley! I think WriMuse looks really interesting. I like being given random things and have to try to work with them. I guess it heralds from my days in improv. I like Fantasymuse the most, I’m new to D&D and need all the help I can get..
Fantasymuse would be amazing for D&D! Looks like I missed the deadline for the contest. I might just have to buy it anyway.